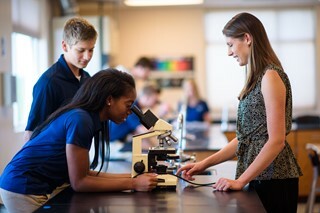 Calvary Christian High School offers employment opportunities to qualified individuals who desire to serve Christ and the students, families, and staff of CCHS. If you would like to be considered for a particular position, please follow the procedures below for applying for employment at CCHS. All of the teachers Calvary employs must meet one of the three qualifications listed below. To apply for a part-time position, please select the link below and complete the part-time employment application. You may submit the completed application by email to: office@cchs.us. You may also mail or bring the completed application to the school office using the address listed on the application. Calvary Christian High School is seeking an experienced social studies teacher with experience teaching the advanced placement courses. The ideal candidate will have at least three years of classroom experience, love teaching high school students, and be eager to grow as a professional educator. A bachelor’s degree in social studies, social studies education, or a related field is required for the position. Preference will be given to applicants with advanced degrees. CCHS is an iPad 1-to-1 school, emphasizing the use of instructional technology and digital curriculum at every level, and teachers enjoy using some of the latest technology available to deliver effective instruction. What is your testimony of your relationship with Jesus Christ? Are you a member of a church? If so, what is the name of the church and who is the pastor? Why are you interested in the position for which you are applying? After a review of the Stage I information, you may be contacted to arrange a phone or in person interview, and you may be requested to complete an employment application. After review of the Stage II information, you may be invited to interview for the position. Teachers will be asked to guest teach in a classroom for the subject area opening. Affirmation of the school's mission, vision, statement of faith, and educational philosophy are required for employment. You may select the links below to review these statements.